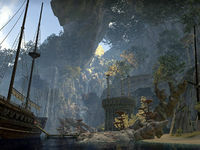 Once a watering stop for the High Elf navy, this great cavernous grotto on the Summerset coast west of Dusk features shipboard compartments, magnificent Aldmeri ruins, weathered wood from several shipwrecks, and a sparkling subterranean waterfall. Colossal Aldmeri Grotto is a player manor accessed from Alinor Docks. 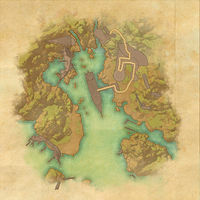 The grotto's actual location is on the southeastern shore, west of Dusk Keep. It will only be purchasable from the Crown Store.